Captain Sir John Franklin. Photo: Wikimedia Commons. Seafaring expeditions of the 19th century were inherently perilous, and not everyone who set out to discover new territories returned to tell the tale. In the case of Sir Franklin’s Arctic expedition of 1845, the crew set sail for the last unmapped section of the Northwest Passage. Little did the doomed sailors know that this frigid voyage into the Great White North would be their last. 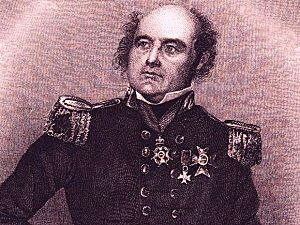 Led by Captain Sir John Franklin’s Royal Navy officer and accomplished explorer who had journeyed into the Arctic three times prior, the British crew certainly had confidence in their mission. The two ships, HMS Terror and HMS Erebus, departed from Greenhithe, England on the morning of May 19, 1845, carrying a crew of 24 officers and 110 men. Dropping anchor in Disko Bay off the west coast of Greenland, crew members wrote their last letters home, while final supplies were transferred to the boats. Five men were discharged before setting sail, bringing the final headcount to 129. The two ships were seen one last time in late July by whaling captains Dannett and Robert Martin in Baffin Bay off the coast of Baffin Island, awaiting good conditions to cross into Lancaster Sound. What happened next would be pieced together from discovered wreckage, icy graves, and letters written by desperate men over the next 150 years. The first winter, ”1845-46, Franklin’s men wintered on Beechey Island, where the first three of his men died and were buried. Continuing on, the crew made it as far as King William Island, where their ships were trapped by ice in September 1847. A note signed by commanding officers and dated April 25, 1848 stated that the crew spent the winters of 1846-47 and 1847-48 on the island. The letter revealed that their leader, Captain Franklin, had died on June 11, 1847, and that the remaining men would attempt an escape on foot, by walking to the mouth of Canada’s Back River and following it into the Canadian mainland. They intended to begin their journey the next day, April 26, 1848. Three years into the Franklin expedition, 24 men had died from hypothermia, malnourishment, or exposure to the elements. The remaining 105 would perish on their last-ditch trek across the Canadian tundra, hundreds of miles from civilization. Their fates, however, would not be known for many years to come. In 1850, search parties happened upon Beechey Island and discovered the winter camp of the expedition’s crew, as well as the graves of the three men who had died there. No notes were found at this site to serve as clues, which left searchers and the crew’s families and friends holding out hope for survivors. It wasn’t until 1854 when news trickled in, from a rather surprising source. Explorer John Rae, who would later be credited with discovering the final portion of the Northwest Passage that Franklin and his men had hoped to find, met an Inuk who informed him of 35-40 white men who had starved to death near the mouth of the Back River. A second Inuit confirmed the story, embellishing his account with grisly details; he recounted incidents of cannibalism among the men, offering small objects from the Franklin expedition crew as proof. Despite knowing now that the expedition was a disaster and that some of its crew members lay buried in the ice, many of the details surrounding the ill-fated voyage remained shrouded in mystery. Searches, excavations and exploratory expeditions continued well into the 1870s with piecemeal results. Bodies exhumed on King William Island revealed cut marks in the bone, suggesting cannibalism. In the early 1980s, scientists once more grew curious over the lost Franklin expedition, and began searching anew. The most recent search, led by a Canadian team, announced in 2014 that it had located and verified the wreckage of HMS Erebus, one of the lost ships. The wreck was designated a National Historic Site of Canada, and its precise location remains hidden from the public.